I didn't jump up and down with excitement when I heard that "Hell's Kitchen" super chef Gordon Ramsay (pictured above) was going to cross the pond and open up an outpost in New York earlier this year. I figured, let the Ramsay groupies make their way to Gordon Ramsay at The London first and let the kitchen work out the kinks on die-hard fans. Good thing too. Initial reviews were tepid to say the least. Still, between Ramsay's celeb allure and the fact that the restaurant has now had several months to get things in order, it seemed high time to pay call - and my friend Keke's business trip to NYC seemed an ideal excuse to reserve a table. We opted for dinner at London's more low-key dining room Maze, and were greeted by a hip, icy, uber-designed atmosphere that proved a sharp counterpoint to the staff's warm hospitality. We were also greeted by a menu of intriguing small plate dinner options, each one sounding more palate-pleasing than the next. We ordered up a few each, sat back with a couple of strong cocktails and awaited a cavalcade of gourmet delights. And delighted we were...My first course of Roasted Sea Scallops was itty bitty, but packed a wallop in terms of flavor and texture. I couldn't help but ooh and ahh as I dipped the delicate, carmelized white meat into a golden raisin purée. That said, the dish's accompanying cauliflower beignets were so miniscule they were hardly worth the bother. The sideline smidgen of crunch only made me ache for more. Luckily, the small plates kept coming. Keke was in heaven tucking into a precious bowl of Wild Mushroom Risotto topped with a frothy emulsion made of Parmesan cheese. I was equally enthralled with a plate of tender Glazed Veal Cheeks, doused with whole grain mustard, served alongside a copper pot filled with lightly toasted Sweetbreads and Spätzle Fricassée. By the time I got around to dessert, a decadent riff on a PBJ - ethereal peanut butter mousse sandwiched between thin slivers of sweet-salty brittle and topped with a luscious quenelle of cherry sorbet - I had officially taken my place among the legions of Ramsay devotees. Mind you, that does not mean that yours truly will be auditioning to be on the next season of "Hell's Kitchen." 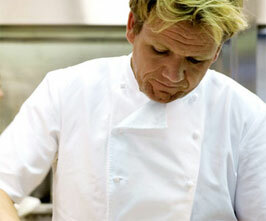 Nor will I be buying a ticket to the U.K. to taste test Ramsay's original restaurants. (Besides, the exchange rate right now is ridiculous!) But a taste of London in New York? As the Brits say - brilliant!